Aussie Home Renovations are a Sydney based contractor specialising in the design and construction of custom luxury bathrooms and kitchens and one-off fixture installations. With over 10 years of experience, we've developed a strong reputation for high quality work and honest consultations, providing realistic, in-house quotes and kitchen solutions to suit your budget. Comprised of fully qualified and expert tradesmen, our team is available 7 days for your kitchen renovation project anywhere in the Northern Suburbs, Eastern Suburbs, Southern Suburbs and Western suburbs of Sydney. Contact us today for an obligation free quote; we're always excited to take on new projects! When it's time to renovate your kitchen in Sydney, think Aussie Home Renovations for professional builders, affordable prices and outstanding results. Contact our team today for a free, no obligation in-home measure and quote. We're available 24 hours 7 days so we can work around your schedule. The kitchen is the heart of your home and can make a significant difference to the look and feel of your home. 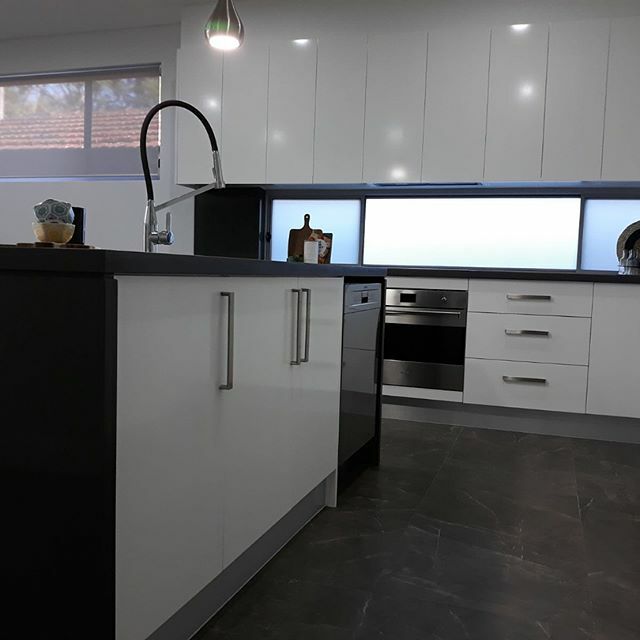 At Aussie Home Renovations, we specialise in budget friendly Sydney kitchen renovations - with over 10 years of experience and thousands of completed projects. Our team of industry professionals will be with you from start to finish, providing a custom kitchen design and build service that is unbeatable on quality and price. We pride ourselves on our ability to deliver complete kitchen renovations that are tailored to you and your life as well as stunning and enduring. Our creative team design modern kitchens that will look good and work well now as well as in 10 years. Are you dreaming of a kitchen that is practical, well designed and stylish? Talk to Aussie Home Renovations today - the experts in innovative kitchen design and construction in Sydney. We begin renovating your new kitchen with top quality materials. about your Sydney kitchen renovation. Talk to our friendly kitchen experts today about your Sydney kitchen renovation.